One of the most important differences between pressure and soft washing a home is that a soft wash system does not damage the exterior of your home. Pressure washing increases the risk of damaging your home, therefore, soft washing is the preferred method when cleaning the exterior of a home. For commercial residencies, soft washing is also the preferred method, however, if mold and algae have been long ignored, some pressure washing is often needed. What kind of wash is more effective? The soft wash system is considered to be more effective when tackling the exterior of a home. The soft wash system eliminates the use of high-pressure, and it turn lasts longer. High pressure simply blasts away the plant life of mold and algae without actually treating the spores that spawn. When professionals use the soft wash system as well as the appropriate chemicals, it doesn’t spread the spores or blast of excretions. When the spores of the mold or algae are killed, it takes much longer for them to reappear (a few years). However, pressure washing is always preferred for the more difficult jobs such as garages, driveways, sidewalks, and patios. 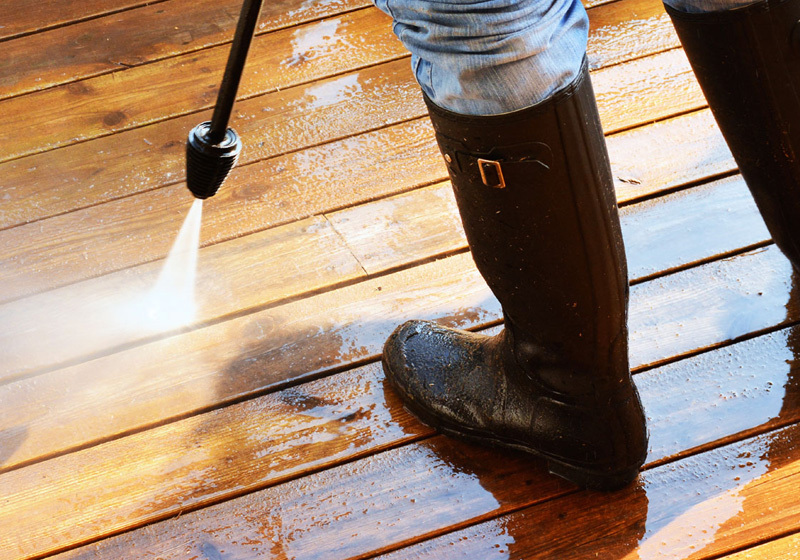 Due to the increased foot traffic in these areas, pressure washing pulls out years of dirt, scum and grease embedded in concrete and wood. How often should pressure or soft washing be done? With the soft wash system, a house with vinyl or aluminum siding will remain clean for a minimum of three years. Stained or painted wood siding is always more porous and requires more attention. Soft washing wood every one to two years thoroughly can help the longevity of the stain or paint. The dark spots on a roof consist of a type of algae that thrives in humid climates; the longer the algae is on the roof, the more time it has to eat away at the shingles. Cleaning a roof every three to four years can ensure a longer life span, increasing its reflective properties that decreases energy costs, and create a better overall curb appeal of your roof. Pressure washing depends on how much foot traffic the area encounters. For example, a busy restaurant would need to have sidewalks pressure washed every two weeks to keep it looking clean. A home’s driveway would need to be cleaned every year or so. Why should I hire professionals? Although hiring professionals may be bit more expensive then cleaning the home yourself, the benefits severely outweigh the costs. Phoenix Clean has encountered home owners in the past who have attempted to pressure wash their own home, not understanding the benefits that soft washing can provide. Risking the damage of your home is a crucial decision, and Phoenix Clean has the equipment, cleaning solutions, and expertise to ensure no damage will occur. Contrary to popular belief, professional washing is inexpensive and affordable. When you consider all the equipment andd chemicals used in the cleaning process, it can make the additional cost of a professional service understandable. Phoenix Clean is committed to customer satisfaction, and the time and energy you will save having a professional service clean your home outweighs the cost. Phoenix Clean always leaves their customers happy, and if you are not happy, we will always resolve any issue without extra charges.